After an indulgent lunch with some non-gaming friends, Rod and Janette, we suggested some simple games to fill a dank, foggy afternoon. We started with a couple of games of ‘Hey, that’s my fish’, which is easy to explain, contains a good degree of tactics and is light-hearted enough to ensure no-one feels bad about losing. To my relief they both enjoyed playing! We next tried playing ‘Tsuro’ and was happy to find another success, especially when both Rod and Janette chalked up victories in the two games we played. 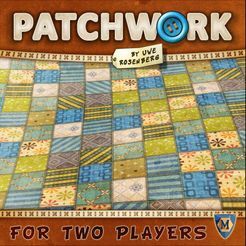 A few days later we played the 2-player game ‘Patchwork’, which I bought Elaine for Christmas. This is a well-thought out game combining a ‘Tetras’ style mechanism with a time factor and button/VP economy. There is a reasonable degree of strategic thinking, both to enhance your own future purchases and to frustrate your opponents moves. Initially Elaine has won every game we played, and it is therefore a hit with her, which is great because it was a prezzie, but rather annoying to me from a gaming perspective (was not sure what I was doing wrong). Later games have seen me take 3 in a row (ha, ha!). Finally we visited our regular gaming friends, Val and Chris, for a post-Christmas get together (and to see what Santa got for them!). 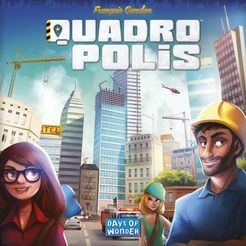 The first game on the table was ‘Quadropolis’, yet another ‘town planning’ themed game (it is surprising how many games use this theme). We played twice and really enjoyed it. The rules were surprisingly easy and the game play fast. The range of options was good and narrowed down as the turn progressed, so a good deal of thought and strategy was required. We only played the base game and look forward to trying the more advanced mode. 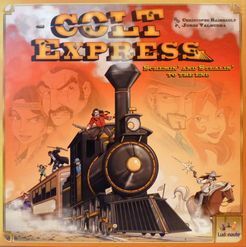 Next we got out ‘Colt Express’, a fun, silly Western themed train heist shoot-out using programmed movement and actions. The most obvious draw is the thick card constructed train and carriages – beautiful! I was a bit disappointed that the characters were only depicted by coloured meeples – miniatures would have been better and in keeping with the high visual standards of the game. I also found the handling of the set up a bit fiddly (or, maybe I’m just ham-fisted). I liked the individual themed abilities for the different characters, which based on a single play, appear balanced. Anyway, Chris won by collecting the most cash and valuables, whilst I managed to get the strongbox. According to Chris you need at least 4 players to get the best from the game. We had a few minutes left, so we ended with a game of ‘Crossing’. This is a fast, furious ‘Party’-style game involving the grabbing of gems. Basically mayhem ensues with people pointing at the location they wish to steal from, and dithering about when to cash their stash and save acquired gems. This game would appeal to non-gamers, and would improve as the alcohol intake increases.